In early 2009, getting an advanced highly skilled ground ambulance was a difficult challenge. If an advanced ambulance was needed with personnel that had critical care knowledge and the ability to treat some of the sickest or most traumatic patients an air ambulance crew had to be called. In inclement weather, there were no advanced care ambulance solutions until Acute Medical Services was formed that same year. Led by a team of highly trained and experienced Paramedics, Emergency Room nurses, and multispecialty physicians, we created one of the most advanced ground ambulance services available. Our units had the ability to treat and transport neonatal, pediatric, and adult patients with any illness or injury. We accomplished this by deploying advanced protocols and pharmacology choices equivalent to most air medical teams. All of this was backed by seasoned paramedic medical direction and support 24/7, backed by emergency medicine boarded physicians. Acute Medical Services’ initial focus was on rural and distant hospitals that heavily relied on larger urban tertiary care hospitals for higher levels of care and services. We started with one ambulance with accepting only ER to ER, ER to ICU, and ICU to ICU transports. 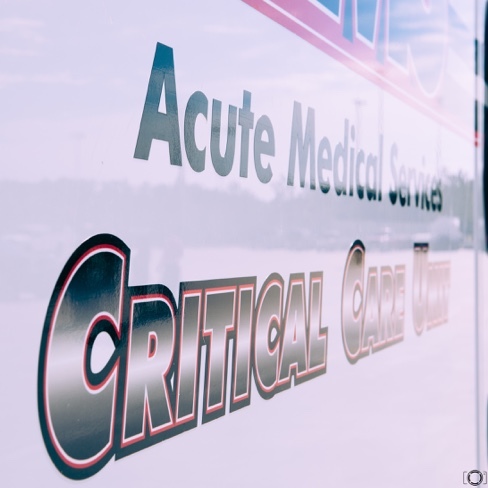 Within one year, we had three critical care ambulances within Harris County to serve the surrounding communities. Although our company pedigree is one of critical care, we have increased our capabilities to serve our customers with a full range of transportation needs. Today, AMS provides services from Specialty Care Transport (SCT) all the way to alternative transportation specialists assisting in non-medical patient transportation. With a rich critical care history rooted in a performance culture, our history has defined a culture that continues to inspire EMS veterans and new graduates alike.